This is a cross post from our friends over at Bike Auckland. Auckland University’s Dr Kirsty Wild. Bike Auckland: Why the interest in ebikes? Kirsty: We haven’t had a lot of research in New Zealand into what’s happening with e-bikes, so it’s about time. We see them popping up everywhere and there’s a lot of interest in their impact. What effect are they having on people’s lives? Are they useful? Are they getting more people cycling? BA: What specifically did you want to learn? Kirsty: What role can e-bikes play in increasing sustainability, efficiency and wellbeing within our urban transport system? 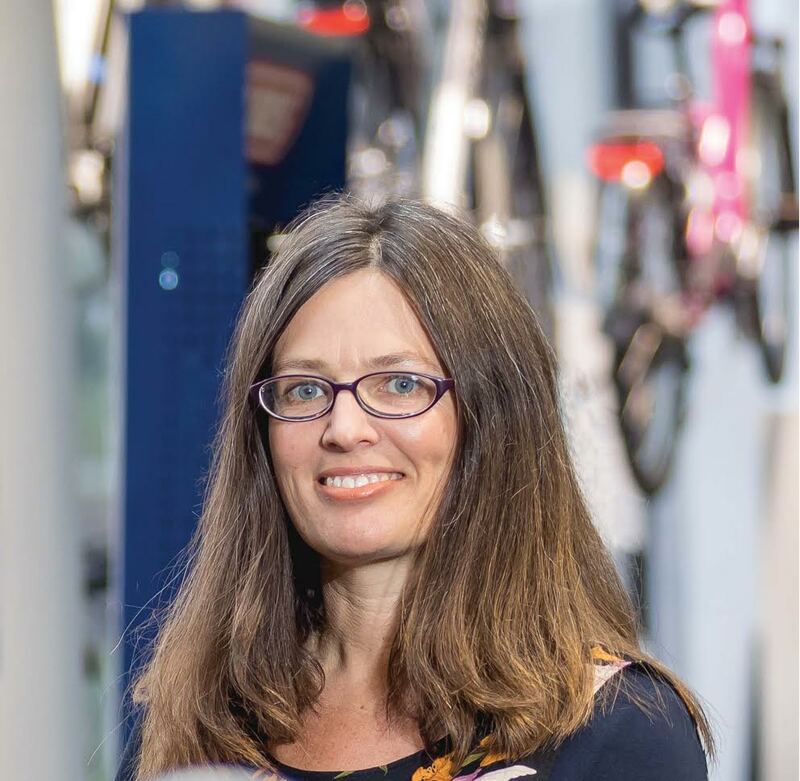 We used Auckland as a case study and I interviewed a range of experts, if you like – people who use e-bikes, people who plan for bikes, and also retailers. We also did a mini-trial at Auckland Hospital. These people were not experts; they were people who were using their cars to get to work and were interested in making the switch to using an e-bike. They were very new to the technology. That helped us understand the issues around what happens in the workplace in terms of supporting people who try out using an e-bike. So they were two separate pieces of research that help us answer the question about what is the potential for e-bikes to really bring about some meaningful change in our transport system. BA: What did the research show you about that potential? Kirsty: The things that really stand out for me is the potential for e-bikes to expand our active transport radius. We traditionally think people might be willing to walk three kilometres and they might be willing to bike five — some people more, but most not. But the study showed that it was really common for people to ride 15 kilometres there and back on their e-bikes. That opens up places like Te Atatu, for example, which has access to a cycle highway that people can use for most of their ride. The point is that e-bikes are tripling our active transport radius, making it so much more accessible for a much wider group of people to use active transport. The other thing that stood out is the value of the cycle highways. Places like the Northwestern Cycleway. E-bikers are faster cyclists and they need good conditions to ride on. They need the free flow that these cycleways provide. The great thing about the Northwestern is that it is right by the motorway; there are so many people stuck in cars and they’re seeing people on bikes on the cycle highway. They’re such a great mode-shift technology, those cycle highways. BA: You also found that e-bikes can help more women get on bicycles. Kirsty: That’s right. If we talk about pushbikes, women are generally about 20 percent of riders. On the Northwestern cycleway, women are 27 percent. But women are 41 percent of e-cyclists. And women themselves offered lots of examples in the study of why e-bikes make riding more realistic for them. I guess what stands out is the way e-bikes enable people to make more car-like trips – longer trips with more trip-chaining. And trip-chaining is more likely to be an issue for women – trips where you drop the kids at school and then go on somewhere else, all within a really tight time budget. Traditionally those trips might not have been possible on a bicycle, but e-bikes enable people to drop their kids off, carry a lot of stuff with them, and get to work without getting all sweaty. People think it’s a strength issue for women, but it’s also a time and responsibility issue for them. And ebikes really help with those issues. BA: It sounds like ebikes can fill the gap between the pushbike and the car. Kirsty: For a lot of trips, yes. Obviously not all trips, like going away on holiday with the family, for example. But for everyday transport, to work and back, they make possible trips that haven’t really been realistic for people on a bike because it was too far and it took too long at the other end for showering and that sort of stuff, and also because people just had too much to carry. So many participants talked about being able to do the shopping on the way home; they didn’t need to ride home and then get into the car to do the shopping. So yes, e-bikes are a middle-mode. They enable people to make more car-like trips. The research shows they’re quite an effective tool for mode-shift for two reasons. One, they enable people to make more car-like trips and two, they’re quite fun. Cycling has the highest mode satisfaction. BA: Some of your participants thought e-bikes were still too expensive. Kirsty: Yes. Eighty percent of New Zealanders have less than $10,000 in savings, so the thought of spending $3000 on a bike is just unrealistic for them. It’s also because culturally we have this sense of transition from bike to car and we associate bikes with being a relatively low-cost leisure device. One of the retailers we spoke to talked about customers being scared to buy a leisure device that’s going to end up in the back of the garage like the kayak or the ab machine. Plus, people have concerns about safety, and they want to try an e-bike out first to see if it is worth spending $3000 on. That was one of the recommendations I made, actually – that we find ways to let people take an e-bike home for a couple of weeks so they can get a sense of whether they feel safe enough on their particular commute. It’s a lot of money to spend if you just don’t know if you’re actually going to use it. BA: Was there anything in the research that really surprised you? Kirsty: I was surprised at how far people were riding their e-bikes. Plenty of them were doing 15km trips. Possible there’s a time budget issue there; ebikes let people do longer rides in less than an hour. One of the reasons people buy an e-bike is because their current commute is awful. Current commuting conditions can be really horrible in a car. International research shows that commuting in congested conditions has a wearying effect on people’s lives. That was something that came through so consistently when we asked people, particularly those on the Auckland Hospital trial, why they made the switch to an e-bike: it’s not just how long the commute takes, it’s the reliability of the arrival time. Really stressful for car drivers. There were drivers leaving at six in the morning because otherwise they couldn’t be sure what time they’d get to work. And when they get there, they have horrific parking problems at the hospital. What a difference an e-bike can make to people’s lives, being happier and more productive, just because their arrival time is now reliable. BA: So when you buy an ebike, you’re also getting some extra happiness? Kirsty: Well, cyclists are consistently shown to be the happiest commuters. And e-bikes are a way of making the benefits of cycling available to a broader group of people. Traditionally cycling has been seen as viable within maybe a five-kilometer radius from the CBD, now with e-bikes that is 15km. People say bikes are cheap, and that’s true: you can buy a bike for $500 but then you need to spend $2 million on a house that is close enough to the CBD to make biking realistic. E-bikes make it possible to live out a bit further and still take advantage of the benefits of cycling. That explains one of the recommendations we made: to invest more in cycle highways because they’re so successful at getting people riding. BA: What happens to your research now? Will it feed into policy? Kirsty: Certainly Auckland Transport is really interested in it and I’ll be trying to talk to ministers about it as well. We’re in this open space right now with what is going to happen with electric vehicles. In the UK they decided to subsidise e-cars but not ebikes; I feel like it’s time to advocate for subsidies and for cities to support e-bikes and not just e-cars. We’ve got politicians and policy-makers who are really interested in this space, so the research has the potential to be really useful. Provide more separated cycle lanes. Provide free-flowing, protected cycle highways within the 15km e-bike ‘goldilocks zone’. Separate pedestrians from cyclists where possible. If an e-bike speed cut out is introduced, it is recommended that it be 32km/hr rather than 25km/hr. Reduce the speed limits on more urban roads to 30km/hr. Provide opportunities for people to try out an e-bike for a trial period of two weeks. Reduce the cost of e-bikes. Investigate opportunities to make e-bikes available to low-income people. Provide more secure bike parking, with e-bike charging facilities. I think the 15km range she quotes is quite conservative, 25km is perfectly reasonable on a decent bike. I’ve been doing this for a few months now and what has struck me is the financial benefits. I live in Howick, the HMB ferry is $15 a day return. If you take the money that you’d spend on the ferry, invest it (I’ve assumed a 6% return) after 10 years you’re $75,000 to the good. That’s serious cash, or you can pay for a house deposit or knock years off your mortgage. Given that ‘They enable people to make more car-like trips,” it’s good to compare the cost of an ebike with the cost of a car – both upfront, and ongoing. Particularly for those 3-bedroom houses with 3 young couples, who fill up the driveway, footpath and verge with their 6 cars, there are real benefits to everyone involved if they could cut down to 1 or 2 shared cars and 6 bikes, including some financial advantages that could really make a difference at that stage in life. I think 15km is generous. 15km on the flat with a separated bike lane is probably good. If you have traffic lights, hills, cars, etc, then no good. I know a woman who does Te Atatu to Parnell each day, and I wouldn’t have thought she was particularly fit. That’s 16 km. And I think you’re right, the separated bike lanes make the difference. I think, too, that once people get into the habit of doing a daily commute of 10 km each way, or so, they’ll start to include the longer occasional trips to other destinations easily. How much time does her daily bike commute take one way? I commute Te Atatu Peninsula to Newmarket – about 17.5km one way. That can be covered in about 35-40mins on an ebike. I cycle (e-cycle?) from Oratia everyday its 17.2 km. It takes 38 minutes going in and oddly 42 minutes coming home. And its consistently this every single time. BTW I took part in Kirsty’s study, it was a pleasure contributing to it. Do you charge your battery at work? I’ve noticed that mine gives out slightly less current when less than 60% charged. The difference is not much but in my case (similar distance as well) this easily amounts to another 4-5mins. I do charge it at work, I don’t know why the difference, the best explanation is that I am pushing harder i the morning because I am such a nerd and I want to get to work on time. I have an eZee Sprint. One day I forgot to charge. I noticed below 50% charge on full boost base speed was 25 vs 30 kmph. Below 20% charge dropped further and at 10% it gets super hard as the bike is heavy. Basically as the cells discharge it gets harder for the battery to deliver consistent current at the same voltage. So the watt output goes down. My 12km to Wiri from Onehunga is relatively flat but no bike lanes and quite a few intersections. It’s about a 30min ride at full boost. I generally do 70% in the morning and 100% home. Based on your numbers you are doing 26 kmph average. I’m doing 24 kmph average. The route is a factor for range. Speed cut out!?? FFS – how about we solve some actual problems, not non-problems. We don’t have speed cut outs for cars. We let people drive to the conditions. Where has this speed cut out idea come from. And there absolutely does need to be a clear distinction between an e-bike and a moped. Potential users of bike paths, and especially pedestrians on shared paths, need to have certainty that all vehicles on the path are going to behave and go at similar speeds to a conventional bicycle. The challenge is that ‘conventional’ road-bicycle can easily reach 50km/h or more (and I see that daily along NW cycleway). It’s not just the speed, it’s also the weight of the vehicle (which impacts stopping distance) that matters. Also, to get to 50 km/hr on a push bike, you generally have to be fit and experienced in traffic, are more able to react quickly, and probably more respectful of the effort an unconfident rider is going to just to be on a bike at all. On an ebike there are plenty of people going fast who wouldn’t have been able to go that fast on a push bike, who aren’t necessarily skilled, and not necessarily aware of the effort involved. The different dynamic does play out slightly differently, and it does worry me. I think ebikes are a great step forward, but I don’t think we’re going to avoid some issues around speed. I think 300 watts is too low for Auckland’s steep hilly roads. The research concluded the power of the ebike has nothing to do with safety. In fact higher power can be safer when you need to accelerate the way out of danger. However I think a power cut off of around 35kmh is useful to prevent super-powered motorbike in the disguise of e-bike. 35 km/hr is an easy sprint with a 300W motor. I do it often without much effort. I think in general over 30 km/hr is hard for a general ebike user on the road. That extra 10-15 km/hr over a normal bike is a big difference in speed. Timing on the road when passing a parked car or intersection with another car behind you can be harder if you are going faster. You have less time to make a decision, so need to plan ahead. Can be challenging to react quickly enough to changes. Given bikes can go on roads and _footpaths_, I think 300W is enough. If you think about a ‘regular’ bike, for a single person – that’s ok. But think about cargo bikes, people towing kids trailers etc. In those circumstances 300W is not enough. Perhaps the solution is to have different categories of ebikes. And perhaps the most powerful one should require some sort of licence (similar to moped/motorbike split). Yes, that true. But some form of certification process will lead to extra costs. Haven’t ridden a full cargo bike. So I can’t comment. However, I’m not sure I’d want to take my kids at 30 km/hr in a cargo bike. 30 km/hr = 50 m in 6 secs. Not a lot of time to make judgement calls in the road environment. 30km/h on a cargo bike does feel fast, mostly because the bike is much heavier (particularly with cargo 🙂 ) than a regular bike. In case of a cargo bike you need that power to start at the lights or go at reasonable pace uphill. I’d say 25km/h is plenty for a cargo bike. Would be great to see some funded discount incentives e.g. $500 off 1 e-bike, or $1,500 if you buy 2. I wonder what the uptake acceleration would look like? There might be a place for assisting some pilot households who were willing to be researched and put in the media. They would need to be low income with heavy car ownership, and wanting to save money, increase fitness, and be more environmentally sustainable. Assistance could be given to paying off the car loan, selling the car and buying the e-bikes and any other equipment needed, with the upfront and ongoing costs/savings made available. Beyond something like this, I think subsidy of ebikes wouldn’t be targetting the people who need subsidy the most. Plenty of low-income people could do with subsidies to their HOP cards, but that’s not offered, despite the environmental benefits. Mercury offer rebates to their customers. $1 billion would probably buy every household in the country an eBike. Is there a better possible transport spend than that? Yes. Not spending the money in the first place and give it back to tax payers with lower taxes. That is a better “spend” of that money. Subsidies to e-bikes is as stupid as subsidies to roads. Are you saying they should privatise the road network? Quite possible these days – I wonder why a right wing party (ACT for example) hasn’t campaigned on that? Perhaps. At least it would be better use of money. But selling public assets is rarely a great idea. Regardless, you don’t have to privatise in order to realise the actual costs of running the network and all the subsidies that are going to freight companies. As long as people don’t have to pay the full costs of roads directly, they use and abuse the common resources as much as they can. Our entire way of life has been distorted by government wasting money on roads. Buying everyone an e-bike is just another problem. You end up giving stuff to rich people (like free first year uni) who can already buy a bike. Meanwhile poor people are less able to make use of bikes. If it is an opt in scheme, everyone will apply for a free bike regardless of if they would ever use it. A huge number of those free bikes will just sit around not being used. Or will just get sold on trade me, hurting all the bike shops. I think if we had to spend that money, I’d imagine you’d be better off establishing a publicly-owned business running an electric-bike share scheme. Realising the ‘actual costs of running the network’ isn’t enough – there is also the fact that very expensive publicly owned land is gifted to road users at the expense of other modes. Unless you price that (which would be very expensive), you have to then subsidise the other modes to make up for it. I personally (sometimes) ride an eBike to work. For me it was the combination of hills and distance that meant I wouldn’t consider a standard bike. Also on an eBike I’m happy to take a longer safer route – on a standard bike I would probably have to ride with 4 lanes of traffic on Mount Albert Road. I think that’s a really important point, Jimbo. In a sprawl city that’s trying to retrofit itself, we might be stuck with cycling infrastructure on only key routes for a while, and ebikes will make it more agreeable to people to divert to use the safer routes. There’s another alternative, of course, which is making all our roads 30 km/hr unless they have separated cycling infrastructure. Since AT has adopted Vision Zero, this is the solution we should be seeing, but we’ll see it when we see it, eh? Good point. I also think it’s safer to travel on some roads on an ebike than on a pushbike, because one can keep up with the traffic flow, by being able to travel at a similar speed to other vehicles, meaning fewer cars passing and fewer frustrated drivers. Especially if one does allow/create passing opportunities at appropriate times**; just as one should in a motor vehicle. Pushbikes are not as well-matched to mixing it with cars and there needs to be separate cycling infrastructure to accommodate them…But I wonder if there may be any issues due to mismatches between pushbikes and ebikes? ** (Footnote: I don’t mean riding close to the kerb all the way down the road. I mean holding one’s lane, but where there’s an opportunity to be considerate without endangering oneself, letting other road users pass, by moving over and briefly slowing down. Again, just as one would like to see more often at times with motor vehicles). E-bikes are great with lots of upside potential. Safety-wise. Health-wise. Transport-wise. More investment into cycle infrastructure is a great long term investment. I switched from PT to an ebike and never looked back. Time saving are immense. My bus round-trip was about 2h on a good day. On an ebike I cover the same distance (there and back) in about 1h 10mins. I’m not tied to an infrequent timetable (20-30mins at best) either. If I need to stay longer or run early – no problems. The variance in time taken is minimal – over the last 6 months I consistently needed between 33 and 37 mins to cover the distance. But not all is great. Even though majority of my commute is along NW cycleway I still have to get to it from home and than cross to Newmarket. And those bits are scary at times. Close passes at speed, being cut off at intersections – those things can put anyone (whether on an ebike or not) off riding. We need proper infrastructure for the last mile too. I definitely feel and see the health benefits. Lower blood pressure, better heart rate at rest and some weight loss. I think the key is the consistency of the exercise – I ride every day. Even with the electric motor it’s still a good exercise, particularly if I keep the speed up. Trip reliability time is a good thing to point out with e-bike commutes when comparing with car travel. I like push bikes but hoping to get an e-bike at some stage. Certainty of commute time was something I hadnt really thought of, either. Imgine if we drew a 15km radius around every RTN stop in Auckland as well as every piece of dedicated cycle infrastructure and made sure everyone had a safe cycling route to both. Plus park and ride at the RTNs. The e-bike profit margin in NZ is just ridiculous. I can get the same spec bike in china for 1/3 of the cost. An average consumer cannot directly buy any e-bike internationally, because NZ customs will reject any import with larger lithium battery. So the consumer has no choice but to be rip off by NZ local merchants. Surely if it goes through a proper customs clearance, there is no issue? Only if the custom make things easy. The reality is the complex paper work and compliance involves is just too much. It only worth the effort if you import hundreds of the same model, and resell it in NZ with huge margin. One off imports tend to be air freighted and that’s where you hit problems with Lithium batteries….. Established retailers will likely import a container load by ship, and there is much less of an issue…. Buying locally gives you access to service and support, parts etc. The pay back period on a mid range ebike about $2.5k is around 6 months for most people. If you can go from 2 cars to 1 car at home it’s even shorter. With e-bikes we talk a lot about congestion, environment etc but it drive adoption, it’s should be a financial decision. It comes to the freedom of choice. If I ride it everyday I probably will buy an expensive model with local support and parts. If I ride it occasionally, I probably will buy a cheap one oversea. However at the moment I can’t, I am forced to buy the expensive model I don’t need. The businesses I know that sell ebikes would not agree with you. Their margins are pretty tight and it is only volume and demand making it worthwhile. Practically no maintenance if it is a quality machine. Not one red cent to ACC for risk. I can not think of a more incentivised mode of powered transport, ever!. You are not quite correct as regarding ACC. Cycling is classed as a recreational sport by ACC so is covered by the PAYE earners levy that all PAYE tax payers pay. Yep; And if there wasn’t a single car on the road then most of those things wouldn’t be necessary at all. But you forgot to mention the big disincentive of risking your life every time you go somewhere due to our road space being almost completely given to cars. Isn’t that a pretty big incentive to drive? Agreed, the completed road network (for cars) definitely provides an incentive to drive over other transportation options. I only started biking to work once the additional infrastructure was completed to keep me off the roads as much as possible (approx 1km out of my 11km commute is non-cycleway/sharedpath). Regarding Waspman’s comment on “No contribution required for any infrastructure upgrades for bikes” – you could argue that all these ‘upgrades’ are less of an upgrade and more of a catch up given how underfunded the walking/cycling budgets have been considering most of the money comes from rates anyway. And the upkeep costs on cycleways / shared paths etc must be considerably lower than roads given the negligible impact pedestrians and bikes have on the surfaces. I do 90% of my trips by bike sand never feel unsafe. Why do you feel so unsafe when you cycle? I actually find Aucklanders fairly considerate and cautious around cyclists. I ride my bike to work in Ellerslie once per week at the moment. Due to the lack of a footpath over the harbour bridge I have to go around the harbour. It is 42km each way and with a total cumulative climb of over 500m each way! Other than the discomfort of 2 x 1.5 hours in the saddle, it really doesn’t take any more effort than a 3 hour brisk walk and is a lovely bit of exercise once per week. In the past I used to ride it occasionally on my road bike and I was ready for a 2 hour snooze when I got to work to recover and feared the return ride all day – now I just feel fresh and ready for work. Imagine the outcry from the bikelash people over all those people not paying road user charges to support their “hobby”! Sorry – how do road user charges support someones hobby? I got a Merida e one sixty 800 electric mountain bike primarily obviously for off road.eg Woodhill Mountain Bike Park and the NZ cycle trails throughout the country. Probably climbs steep streets better than commuter bikes. Speed restriction is 32 km/hr. Not that I do commuting with it however it handles roads really well. The motor overpowers the larger tyres and quite comfortable with full suspension. What I am getting at is that these bikes can do two tasks ie fun off road and commuting to justify the expensive cost. Just a question about e.bikes – what sort of brakes do they have – cycle or motorcycle type. If it’s the former, I wouldn’t be surprised if we see ACC involved and we get some sort of government regulation requiring the latter, just like the compulsory wearing of helmets came in after a few cyclists were killed in accidents. The usually have disc brakes, some of the cheaper ones have calipers. No after one boy was brain damaged in Palmerston North and his mother went on all caps rage around schools in NZ spreading disingenuous propaganda and demonising cycling. I remember her coming to our school in Chch in the early 90s and just saying the most outrageous things. Plus describing in detail the condition of her son. The number of students cycling steadily dropped from that time and the cars started to clog up the surrounding streets. A disaster for a city that used to be full of cyclists. At what point will we have bicycle congestion? it will be nice to ahve the problem however can we prepare for it in advance? The EU and NZTA’s reasoning for a 25km/hr limit is safety. An e-bike needs to operate in a similar manner to a bicycle. If e-bikes are being lauded as faster than bicycles, then they should be considered mopeds. The 300W limit is the voltage x current that can be supplied to the motor. There are many e-bikes that exceed this by their owners admission, in the 500-850W range, and a couple above this. They should all be registered as mopeds but there is no enforcement. Some e-bikes are ridden with behaviour different to bicycles. They are not looking and planning ahead, and they have little incentive to conserve momentum. It is irritating to be passed by an ebike who then slows abruply for an easily negotiated corner or hill or trys to pass but then has to push into a bunch as they’ve misjudged speed and there is an oncoming bike or ped.